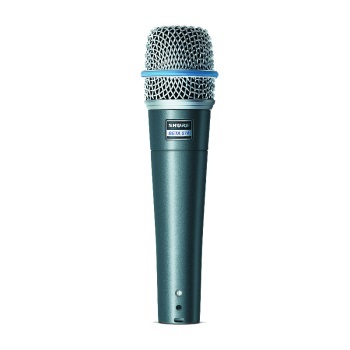 The Shure BETA®57A is a high output supercardioid dynamic microphone designed for professional sound reinforcement and project studio recording. It maintains a true supercardioid pattern throughout its frequency range. This insures high gain-before-feedback, maximum isolation from other sound sources, and minimum off–axis tone coloration. Excellent for acoustic and electric instruments as well as for vocals, the extremely versatile Beta 57A dynamic microphone provides optimal warmth and presence.